Uniform is a geometric typeface created by Richard Miller and published by Miller Type Foundry. Based on a circular concept, it brings freshness and originality with this new notion that connects circular geometric typefaces and condensed straight-sided typefaces. Deriving from a common root, the O of the Regular, Condensed and Extra Condensed width share attributes of the same circular theme. It also provides numerous opentype features like Old Style Figures, Tabular Lining Figures, Alternate characters and Ligatures. 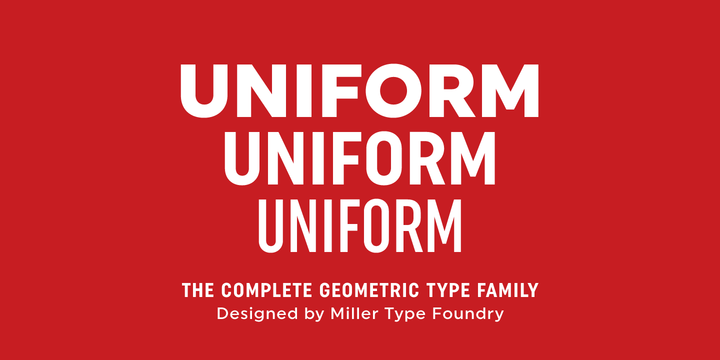 ‘Uniform’ is a trademark of Miller Type Foundry. A font description published on Monday, November 3rd, 2014 in Fonts, Miller Type Foundry by Iulia that has 3,295 views.